Are there markets in St. Petersburg? 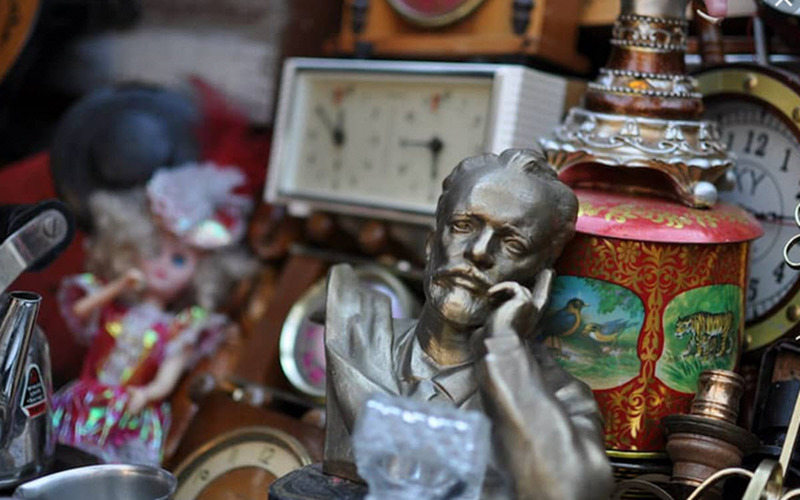 Yes, there are several interesting markets in St. Petersburg that can be worth a visit. Here are a few suggestions. Directions: Take the blue metro line to Udelnaya station. After ascending on the escalator, turn right, cross the railway, turn right again. The market consists of several different sections, some with and some without a roof, some with stalls and some where merchandise is simply placed on blankets on the ground. The items for sale vary a lot; some are second-hand as one can expect from a flea market, but there are also a lot of new stuff on offer. This started out as a book market, but today a lot of different things are sold here. Souvenirs are typically cheaper here than in the city centre, partly because tourists are rather rare at this market. Many Russian cities have, or have had, a market called Gostiny Dvor, since the term denotes a market where vendors from outside the city can congregate to put their goods on display. The Gostiny Dvor in St. Petersburg has been in use since the mid-1700s and is one of the oldest shopping arcades in Europe. Work on the indoor complex commenced in the 1750’s but many augmentations has been made since then, and after WWII the inner walls were removed to create a big open space. Compared to the other markets in St. Petersburg, prices here can be a bit high, partly because it is so centrally located and because it is indoors. It sprawls the intersection of Nevsky Prospect and Sadovaya Street. The total market area is 53,000 m2. Good outdoor market if you want to pick up a few souvenirs. You’ll find it at Nab. kanal Griboedova 2, behind the Church of the Saviour on the Spilt Blood. A lot of counterfeit goods, so stick to souvenirs and don’t try to buy anything with a brand name. There are some really nice chess boards available. Since the market is for tourists, many of the vendors speak English so you don’t have to haggle in Russian. This is a 35 acre large combination of open-air market, retail block, and street-facing shops, nestled between the Fontanka River and Sadovaya Street, south-west of the Alexandrinsky Theatre. Apraksin Dvor is currently in the midst of a long-term revitalization project, so some parts have already been renovated, others are being fixed up right now, and quite a few are still (charmingly or not so charmingly) shoddy and worn down. Many of the really cheap market stalls were removed in the late 2000s and placed at Grazhdansky Rynok instead. There has been a market here since the mid-1700s, but the early wooden buildings burnt down in 1782. The name of the market is derived from Count Apraksin who used to own the land. In 1913, there were over 500 shops here + another 250+ small vendors on an adjacent market. After the revolution of 1917, most of the Apraksin Dvor buildings were given over to use as depots and warehouses. This market is not located smack in the city centre, which helps keep prices down. The address is Ulitza Rustavelli 45B.